To get the lowest garage door prices simply follow this seldom used tip! First, determine what style of replacement garage door you will want from the many available styles. 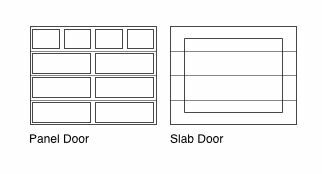 Generally, garage doors fall into two main classes: panel doors and slab doors as shown below. You can get them in wood or metal and the metal ones can usually be insulated by the manufacturer. The panel garage door types often have windows near the top of the door in the upper panels. The slab garage door types are just as their name implies, flat surfaced slabs. They are generally used for a garage door design that requires applied moldings to the slab surfaces and can be made to match an ornate home design tying the theme all together. When executing a garage door replacement project, give due consideration to the design and style of the doors for a successful finished result. Second, measure your existing garage doors to determine the size of doors you will need. Most single doors are seven feet high and nine feet wide. A double door is usually sixteen feet wide. Heights can vary from a little under seven feet to eight feet high for residential garage doors. Widths can vary from as little as eight feet wide up to eighteen feet wide. Third, go to the Big Box Home stores and shop their garage door prices for the garage doors that you want and write down the pricing, brand name and model name and/or number. Make sure the door you want comes with all of the needed hardware such as tracks, torsion spring, bolts, nuts, manual locking device with key, etc. Editor's Note:: do not buy a garage door with extension springs. The best and safest setup is the torsion spring system that mounts directly above the door opening. Fourth, search the web for the brand and model of garage door you have chosen and compare the garage door prices on the web to the Big Box Home store pricing in your locale. You will usually find a lower price for the exact garage door you want from a dealer you have never heard of that only sells on the web. Fifth, print a copy of exactly what you find on the web for the chosen garage door and make sure that the printed copy clearly shows the size of door, the style of door (panel or slab / wood or metal or metal insulated) the brand name of the door, the model name and/or number of the door, the door prices, and the name and location of the dealer on the web. Sixth, take your printed price quote to the Big Box Home store and ask the sales representative if he can beat the door prices quoted to you for the specified garage door. The sales representative will usually be allowed to meet the price but his supervisor is authorized to beat the price. If you can't get the sales representative to move off of the quoted garage door prices from your web quote, ask to speak with his supervisor. Once the supervisor has been requested he or she knows that you are serious and will give you better prices than your quote nearly 90% of the time. Your advantage here is that you are prepared and know the garage door product that you want and the price it sells for elsewhere. You aren't "shopping", you are "buying." It helps if you are pleasant and smile during the entire transaction because that pleasant attitude disarms the store staff. Happy Price Hunting! Share your garage door pricing story with our readers. We would love to hear all about how you got the lowest possible price for your new garage door. Tell us the details and the strategies you used. If you have photos of your new garage door, feel free to upload them.